Dementia is an umbrella term for several brain disorders that are characterized by the overall memory loss and a gradual decrease in the ability to think. The term dementia includes several disease like Alzheimer’s disease , Parkinson’s disease, vascular dementia, Dementia with Lewy bodies, frontotemporal dementia, Normal pressure hydrocephalus, Creuzfeldt Jakob’s disease and Huntington’s disease. A patient with dementia have difficulty in making decisions as well as controlling their emotions. The dementia patients forget simple day to day things which make their daily activities a challenge. The symptoms of dementia become more prominent as the patient ages . Alzheimer’s disease is the most common form of dementia. Among the patients who have been diagnosed with dementia, 60-70% of them have Alzheimer’s disease . It is a chronic neurodegenerative disease that is progressive. The symptoms of Alzheimer’s worsens with time as the patient ages . There is currently no cure of Alzheimer’s. It is more common among people who are more than 65 years of age, although there are several cases where the patient is much younger than 65 years. This disease was first described by German physician Alois Alzheimer in early nineteen hundreds. The disease was later named after him . The cause of Alzheimer’s disease is not fully understood. Several studies reveal a genetic predisposition to the disease in about 70% of the patients. The patients with Alzheimer’s are characterized by the presence of plaques in the brain which are believed to be caused by misfolded proteins. Injury in head, history of depression and hypertension are thought to be other probable causes of the disease. There are several stages of Alzheimer’s namely early stage, middle stage and late stage Alzheimer’s. The stages are usually defined by the progression of the disease. Alzheimer’s is one the costliest disease in the developing world , . What are the major differences between Dementia and Alzheimer’s disease? Dementia is a broad term that describes many brain disorders like Alzheimer’s disease, Parkinson’s disease, vascular dementia, Dementia with Lewy bodies, frontotemporal dementia, Creuzfeldt Jakob’s disease, Normal pressure hydrocephalus, and Huntington’s disease. Alzheimer’s disease is a one of the many diseases of dementia. Dementia is a syndrome not a disease. A syndrome is a group of symptoms that occur together. A syndrome does not have a definitive diagnosis. On the other hand, Alzheimer’s is a disease. Both these conditions are diagnosed by medical imaging of the brain . There are several types of dementia like vascular dementia, dementia with Lewy bodies and many others. Alzheimer’s disease does not have different types. There are several hypothesis for the cause Alzheimer’s. The Tau protein mis-folding and/or the presence of beta amyloid deposits are the major hypothesis for Alzheimer’s. But the cause of dementia depends on the type of dementia. Not all disease that come under the umbrella of the term dementia are genetic. Vascular dementia is one such example. On the other hand, 70% of people with the Alzheimer’ have a genetic predisposition. There are people who have more than one type of dementia called mixed dementia. Alzheimer’s disease does not have different types, so there is no mixed Alzheimer’s. Although sometimes Alzheimer’s and another type of dementia like vascular dementia occur together. Alzheimer’s is a neurodegenerative disease but dementia can also be caused by HIV infections, stroke, vascular diseases, depression and drug use. Number of people with dementia was 46 million in 2015 whereas number of people with Alzheimer’s was 29.8 million in the same year as reported by the World Health Organization . The symptoms of Alzheimer’s include difficulty remembering things or impaired memory, apathy, depression, confusion, disorientation and difficulty speaking. Some of these symptoms will be shared by some types of dementia but specific types of dementia has specific symptoms too. Parkinson and Huntington’s disease have involuntary movements unlike Alzheimer’s. Some types of dementia treatment is reversible but Alzheimer’s disease is terminal illness it is not reversible. Some of the causes of easily reversible dementia is Vitamin B12 deficiency, hypothyroidism, Lyme diseases and neurosyphillis. The differences described above are listed in a tabular form below. What is it? 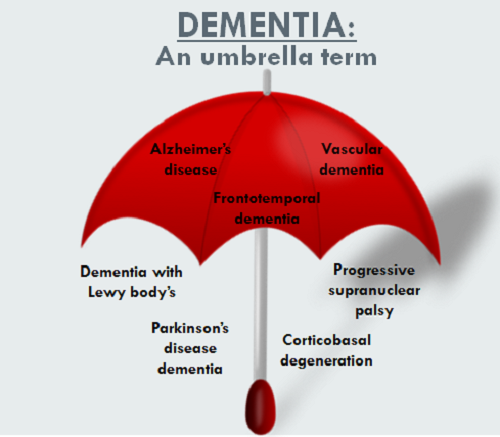 Dementia is an umbrella term that describes many brain disorders like Alzheimer’s disease, Parkinson’s disease, Vascular dementia etc. It is one of the diseases in dementia. A mix of disease A single patient can have mixed dementia, that is, different forms of dementia occurring together. Alzheimer’s disease is a single disease. Several forms of the disease do not exist. Cause of the disease Some forms of dementia have a genetic predisposition. But dementia can also be caused by HIV infections, vascular diseases, stroke, depression and drug use This is a neurodegenerative disease. Number of patients Forty six million people were reported to have dementia in 2015 in a report by world health organization 29.8 million people has the disease by the same report. Reversible or irreversible Some of the types of dementia are reversible. Some of the causes of reversible dementia is Vitamin B12 deficiency, hypothyroidism, Lyme diseases and neuro-syphillis This is a terminal disease, once the disease starts progressing, there is no looking back. Both dementia and Alzheimer’s disease are brain disorders that are impair the normal daily functioning of the affected individual. Dementia is an umbrella term for several of the brain disorders resulting in memory loss, forgetfulness and decrease in the ability to think. Dementia is a syndrome. Alzheimer’s disease is a neurodegenerative disease that has defined stages of progression. Both Alzheimer’s and dementia usually occur in people of older age (older than 65 years) but they are also occur in younger people (although much less frequently). Up to seventy percent of people affected with Alzheimer’s has a genetic predisposition. There are different types of dementia and some forms of dementia are reversible. Sometimes treatment of Vitamin B12 deficiency, hypothyroidism, Lyme diseases and neuro-syphillis results in treatment of dementia. Alzheimer’s on the other hand is not reversible. As of now, there is no cure of Alzheimer’s disease. There are several drugs that are used to control the symptoms of the conditions but there is not enough evidence for their effectiveness. Both dementia and Alzheimer’s are very expensive and involve a lot of care giving. These conditions are very stressful for the near and dear one. They are very financially draining. There is also a social stigma against those affected by these chronic conditions. Debashree Basu. "Difference between Dementia and Alzheimer’s." DifferenceBetween.net. November 6, 2017 < http://www.differencebetween.net/science/health/difference-between-dementia-and-alzheimers/ >. Burns A, Iliffe S (5 February 2009). "Alzheimer's disease". The BMJ. 338: b158. PMID 19196745. doi:1136/bmj.b158. "Dementia Fact sheet N°362". World Health Organization. March 2015. Archived from the original on 18 March 2015. Retrieved 13 January 2016. Ballard C, Gauthier S, Corbett A, et al. (19 March 2011). "Alzheimer's disease." Lancet. 377 (9770): 1019–31. PMID 21371747. Evolution in the Conceptualization of Dementia and Alzheimer's Disease: Greco-Roman Period to the 1960s. Neurobiology of Aging. 1998,19(3):173–89. doi:1016/S0197-4580(98)00052-9. PMID 9661992. The Economical Impact of Dementia. Presse Médicale. 2005; 34(1):35–41. French. doi:1016/s0755-4982(05)83882-5. PMID15685097. Sager MA, Hermann BP, La Rue A, Woodard JL (2006). "Screening for dementia in community-based memory clinics"(PDF). Wisconsin Medical Journal. 105(7): 9. PMID 17163083.